Few topics in medicine are as controversial as the treatment of low testosterone. This hormone is such a powerful and important one that it has been the subject of abuse and underuse. If you want to start a fight at a medical convention just say the word "Testosterone" and watch what happens. 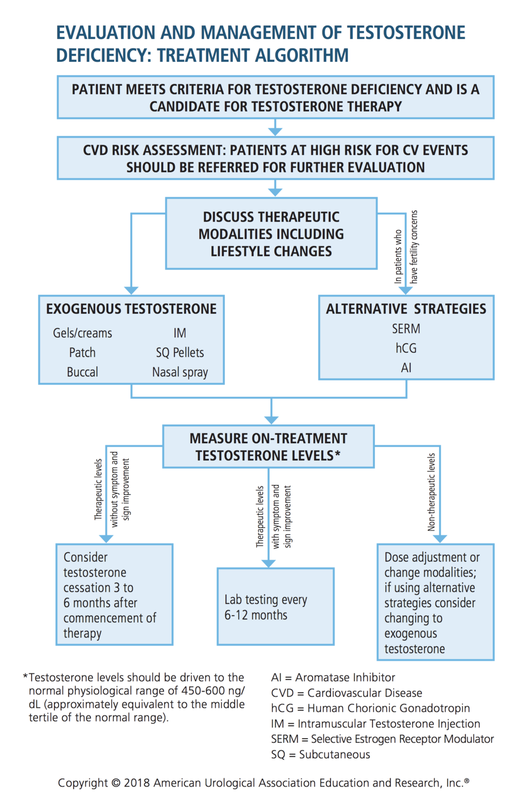 If you are at this page you probably have done quite a bit of reading already, so we'll start with the official 2018 AUA guidelines on the diagnosis and treatment of low testosterone. As you can see from the statements below, low testosterone is a legitimate medical condition which needs to be properly worked up. It's not enough to just measure it and prescribe it. The reason is that low testosterone is not a "condition" but rather a "symptom" which can have an underlying cause. It's like seeing smoke coming out of your house and instead of looking for the fire you turn on the fans to get rid of the smoke rather than find where the fire is and extinguish it with water. The solution to your low testosterone could be water rather than a fan! Another controversial point of view that some physicians will take is that "older men have lower testosterone on average therefore we do not need to fix it". Although it is true that as men age their testosterone can decline "Andropause", but this is not a reason to not treat it. It's like saying that older people have more joint problems than younger people therefore they should not seek treatment for that. As we age, we do have more medical conditions, and we are lucky to live in an age where there are solutions, so let's use them! Yet another controversial practice that many "Men's Clinics" are taking is to measure Testosterone and give it regardless of symptoms. They are using statistical variations in lab results as a reason to provide unnecessary treatment. If you do not have the symptoms of low testosterone you should not accept to take Testosterone: the data is clear on this. The reason is that Testosterone is an important hormone in your body and having too much of it can mess up other things that get affected by it. The bottom line is "if it's not broke dont mess with it" because you might break something else.